At Sanner's Lake we offer many different firearms and archery training opportunities. All of our classes are offered on a not-for-profit basis by volunteer instructors. Maryland Handgun Qualification License (HQL) and Maryland Handgun Wear & Carry Permit Training: Currently, MD law requires most people to take a training class in order to receive the MD Handgun Qualification License (HQL) which is mandatory for most people to purchase a regulated handguns. We offer classes that meet the training requirements for the MD HQL. We also offer MD Handgun Wear & Carry Permit training that enables successful graduates to apply for their carry permits here in MD. Although such a permit is not guaranteed (needing a state-recognized "Good & Substantial" basis), it has become more realistic to gain such permits in recent years. Our W&C Classes discuss this in great detail. NRA Firearms Classes: We also offer many NRA classes such as Basic Rifle, Basic Shotgun, Metallic Reloading, Personal Protection in the Home, and Personal Protection Outside Of The Home, to name a few. We also offer MDSee the full description of offerings below. Other Classes -- Safety, Archery, Hunter Education: Additionally, we offer NRA Safety Classes (Eddie Eagle and Refuse to be a Victim), various Instructor-certification classes, Women Only classes, MD DNR Hunter Education classes and USAA Archery Instruction. SLSC Deputy Training Coordinator: David McCaskill, (301) 904-1660, david@dmacfirearms.com. This class consists of the NRA FIRST Steps Pistol plus the required MD HQL content. The NRA FIRST Steps Pistol is designed to provide a hands-on introduction to the safe handling and proper orientation of pistols. This course is at least three hours long and includes classroom and range time learning to shoot a pistol. Students will learn the NRA’s rules for safe gun handling; the pistol parts and operation; ammunition; shooting fundamentals; cleaning the pistol; and continued opportunities for skill development. Students will receive the Basics of Pistol Shooting handbook, NRA Gun Safety Rules brochure, Winchester/NRA Marksmanship Qualification booklet, FIRST Steps Course completion certificate. And after completing the additional MD HQL session students will have met the training requirements to apply for the MD Handgun Qualification License. 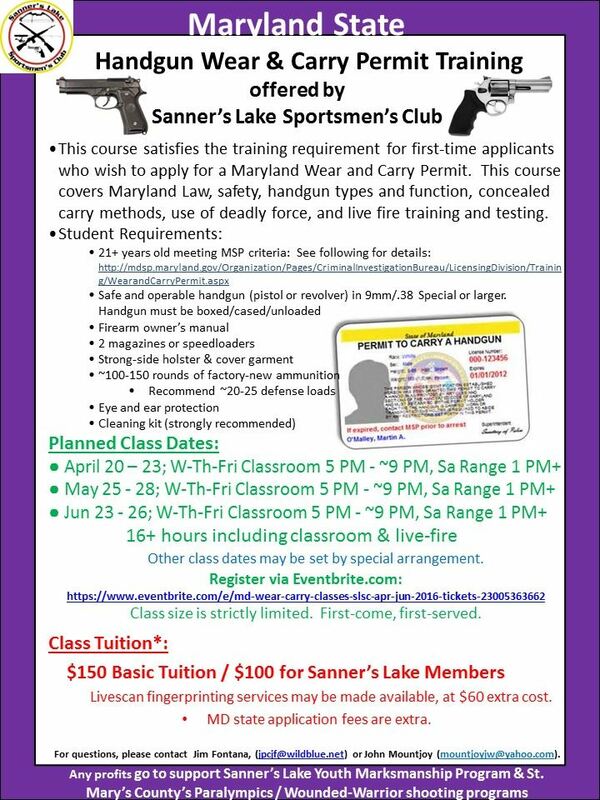 This course satisfies the training requirement for first-time applicants who wish to apply for a Maryland Wear and Carry Permit. This course covers MD law, safety, handgun types and function, concealed carry methods, use of deadly force, and live fire training and testing. More details can be found on the class flyer including student requirements. Basic Pistol Shooting Course - This course is at least 8-hours long and includes classroom and range time learning to shoot revolvers and semi-automatic pistols. Students learn NRA’s rules for safe gun handling; pistol parts and operation; ammunition; shooting fundamentals; range rules; shooting from the bench rest position, and two handed standing positions; cleaning the pistol; and continued opportunities for skill development. Students will receive the NRA Guide to the Basics of Pistol Shooting handbook, NRA Gun Safety Rules brochure, Winchester/NRA Marksmanship Qualification booklet, take a Basics of Pistol Shooting Student Examination, and course completion certificate. Basic Rifle Shooting Course - This course is at least 14 hours long and includes classroom and range time learning to shoot rifles. Students learn NRA’s rules for safe gun handling; rifle parts and operation; ammunition; shooting fundamentals; range rules; shooting from the bench rest, prone, sitting, standing and kneeling positions; cleaning, and continued opportunities for skill development. Students will receive the Basics of Rifle Shooting handbook, NRA Gun Safety Rules brochure, Winchester/NRA Marksmanship Qualification booklet, take a Basics of Rifle Shooting Student Examination, and receive a course completion certificate. Basic Shotgun Shooting Course - This course is at least ten-hours long and includes classroom and range time learning how to shoot shotguns at moving targets. Students learn NRA’s rules for safe gun handling; shotgun parts and operation; shotgun shell components; shotgun shell malfunctions; shooting fundamentals; range rules; shooting at straight away and angled targets; cleaning; and continued opportunities for skill development. Students will receive the Basics of Shotgun Shooting handbook, NRA Gun Safety Rules brochure, Winchester/NRA Marksmanship Qualification booklet, take a Basics of Shotgun Shooting Student Examination, and receive a course completion certificate. Basic Personal Protection in the Home Course - This is an eight-hour course. Students should expect to shoot approximately 100 rounds of ammunition. Students will learn basic defensive shooting skills, strategies for home safety and responding to a violent confrontation, firearms and the law, how to choose a handgun for self-defense, and continued opportunities for skill development. Students will receive the NRA Guide to the Basics of Personal Protection In The Home handbook, NRA Gun Safety Rules brochure, the Winchester/NRA Marksmanship Qualification booklet, and course completion certificate. This class has prerequisites that must be meet prior to taking the class. America's Rifle Challenge (AR-15s) - NRA America’s Rifle Challenge presented by Daniel Defense® is a brand new program designed to take you, the owner of America’s most popular rifle, beyond typical target practice at the range. The AR Challenge offers opportunities to learn new, or further develop, your skills. The SLSC AR Challenge, Sunday May 15th, 2016, is for AR owners of all skill levels but is tailored for new or less experienced shooters. The program includes clinic demonstrations, shooting skill drills at three shooting stations, a fifty shot rifle range course from distance of 7 yards to 100 yards, lunch, and a raffle ticket. Basic Range Safety Officer Course - This course is nine hours long and is conducted in a classroom and at a shooting facility. Range Safety Officer candidates will learn roles and responsibilities of an RSO; Range Standard Operating Procedures (SOPs); range inspection; range rules; range briefings; emergency procedures; and firearm stoppages and malfunctions. Each Range Safety Officer Candidate will receive an RSO Student Study Guide, a Basic Firearm Training Program brochure, an NRA Gun Safety Rules brochure and a Course Evaluation form. Basic Metallic Cartridge Reloading Course - This course is eight hours in length and is conducted in a classroom. Each student is taught reloading safety; centerfire cartridge components; using the reloading manual and reloading data; equipment; and the metallic cartridge reloading process. Students will receive the NRA Guide to Reloading handbook, the Basic Reloading Student Exam, a course completion certificate, NRA Gun Safety Rules brochure, a Basic Firearm Training Program brochure and a Course Evaluation form.